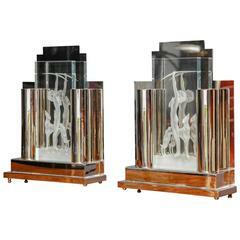 Pair of bedside or table lamps gilt metal style bronze model plant by the artist Stephane Galerneau. Sign on the base Galerneau Paris. Height top of sculpture 43 cms. He is one of the artist who have worked for Fondica like Mathias, Pierre Casenove, Nicolas Dewael. Famous design like Maison Jansen, Charles, Hollywood Regency. 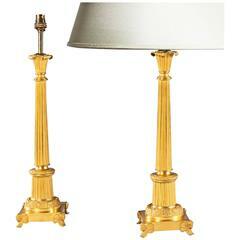 Elegant pair of table or bedside lamps by the artist designer Nicolas De Wael for the foundry Fondica in Gisors France. Gilt bronze. 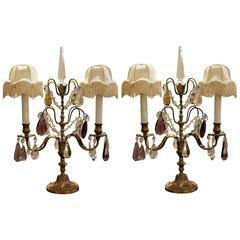 Pair of French gilt bronze lamps. 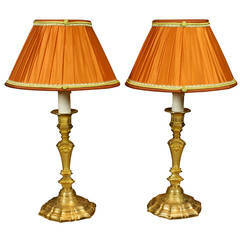 Pair of French Louis XIV style gilt bronze candlesticks, converted to table lamps, with recent French pleated silk lampshades. These lamps have been wired for the U.S. Pair of table lamps custom-made on order for a design shop in Milan. Unique pair. Pair of 19th century French gilt bronze figural lamps of a hunter and gatherer. 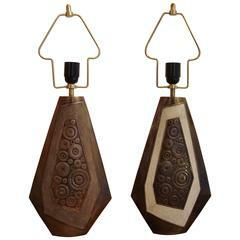 Gilt bronze bases original, custom wired and shaded.